Indiana Jones Cat Bridge | Nerd Much? To most, it’s tough to justify spending $150+ on something for your cat. 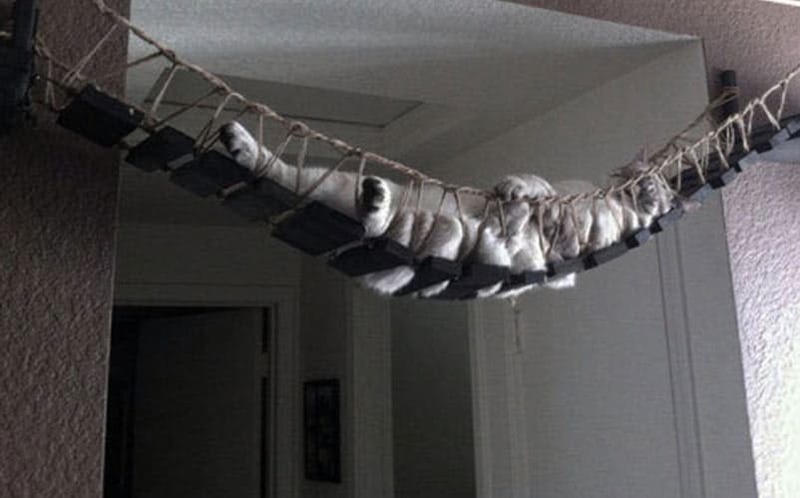 But to some, like us cat-lovers, the Indiana Jones Cat Bridge is more like a necessity, not an option. This extremely sturdy bridge safely holds up to 85 pounds, and will quickly become your cat’s favorite thing. Each bridge is handcrafted and built to order. The bridges are roped with paracord, and the roping is weaved 3″ high along the bridge’s entirety. The bridge slats are 7.5″ wide and are securely attached to the 9″ x 18″ platforms that come with it. The bridge is available in varying lengths ranging from 20 inches to a whopping 95 inches. There are also 8 color options available for the wood, including espresso, natural, white, onyx, red mahogany, gray, english chestnut, and an unfinished option. What’s more, you can also choose bracket colors which include black, cream, chestnut and nickel. So if your cat to traverse across doorways in a cool and unique way unlike anything we’ve seen before, the Indiana Jones Cat Bridge by CatastrophiCreations is a great option. For more frivolous cool stuff you don’t need to buy, stay tuned to Nerd Much.